^ 1.0 1.1 Penzias, A.A.; Wilson, R.W. A Measurement of Excess Antenna Temperature at 4080 Mc/s. Astrophysical Journal. 1965, 142: 419–421. Bibcode:1965ApJ...142..419P. doi:10.1086/148307. ^ Smoot Group. The Cosmic Microwave Background Radiation. Lawrence Berkeley Lab. 28 March 1996 [2008-12-11]. （原始内容存档于2011-06-13）. ^ Enßlin, Dr. Torsten. Planck reveals an almost perfect Universe. Max-Planck-Gesellschaft. [3 June 2013]. （原始内容存档于2014-04-05）. ^ 4.0 4.1 4.2 Fixsen, D. J. 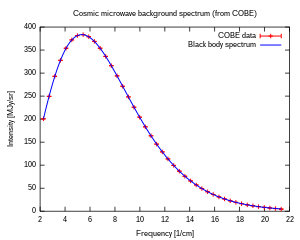 The Temperature of the Cosmic Microwave Background. The Astrophysical Journal. December 2009, 707 (2): 916–920. Bibcode:2009ApJ...707..916F. arXiv:0911.1955. doi:10.1088/0004-637X/707/2/916. ^ Dodelson, Scott. Coherent Phase Argument for Inflation. 2003. arXiv:0309057 请检查|arxiv=值 (帮助) [hep-ph]. ^ Wright, E.L. Theoretical Overview of Cosmic Microwave Background Anisotropy. (编) W. L. Freedman. Measuring and Modeling the Universe. Carnegie Observatories Astrophysics Series. Cambridge University Press. 2004: 291. ISBN 0-521-75576-X. arXiv:astro-ph/0305591. ^ Guth, A. H. The Inflationary Universe: The Quest for a New Theory of Cosmic Origins. Basic Books. 1998: 186. ISBN 978-0201328400. OCLC 35701222. ^ Cirigliano, D.; de Vega, H.J. ; Sanchez, N. G. Clarifying inflation models: The precise inflationary potential from effective field theory and the WMAP data. Physical Review D. 2005, 71 (10): 77–115. Bibcode:2005PhRvD..71j3518C. arXiv:astro-ph/0412634. doi:10.1103/PhysRevD.71.103518. ^ Abbott, B. Microwave （WMAP）All-Sky Survey. Hayden Planetarium. 2007 [2008-01-13]. （原始内容存档于2013-02-13）. ^ Gawiser, E.; Silk, J. The cosmic microwave background radiation. Physics Reports. 2000,. 333–334: 245. Bibcode:2000PhR...333..245G. arXiv:astro-ph/0002044. doi:10.1016/S0370-1573(00)00025-9. ^ Smoot, G. F. Cosmic Microwave Background Radiation Anisotropies: Their Discovery and Utilization. Nobel Lecture. Nobel Foundation. 2006 [2008-12-22]. （原始内容存档于2011-06-23）. ^ Hobson, M.P. ; Efstathiou, G.; Lasenby, A.N. General Relativity: An Introduction for Physicists. Cambridge University Press. 2006: 388. ISBN 0-521-82951-8. ^ Unsöld, A.; Bodo, B. The New Cosmos, An Introduction to Astronomy and Astrophysics 5th. Springer–Verlag. 2002: 485. ISBN 3-540-67877-8. ^ McKellar, A.; Kan-Mitchell, June; Conti, Peter S. Molecular Lines from the Lowest States of Diatomic Molecules Composed of Atoms Probably Present in Interstellar Space. Publications of the Dominion Astrophysical Observatory (Victoria, BC). 1941, 7 (6): 251–272. doi:10.1016/0969-8051（96）00073-X. ^ Weinberg, S. Oxford Astronomy Encyclopedia. John Wiley & Sons. 1972: 514. ISBN 0-471-92567-5. ^ Gamow, G. Cosmology and Controversy: The Historical Development of Two Theories of the Universe. Courier Dover Publications. 2004: 40 . ISBN 978-0-486-43868-9. ^ Shmaonov, T. A. Commentary. Pribory i Tekhnika Experimenta. 1957, 1: 83. doi:10.1016/S0890-5096（06）60772-3 （俄语）. ^ Naselsky, P. D.; Novikov, D.I. ; Novikov, I. D. The Physics of the Cosmic Microwave Background. 2006. ISBN 0-521-85550-0. ^ Doroshkevich, A. G.; Novikov, I.D. Mean Density of Radiation in the Metagalaxy and Certain Problems in Relativistic Cosmology. Soviet Physics Doklady. 1964, 9 (23): 4292. Bibcode:1999EnST...33.4292W. doi:10.1021/es990537g. ^ First Direct Evidence of Cosmic Inflation. Release Number 2014-05. Harvard-Smithsonian Center for Astrophysics. March 17, 2014 [2014-03-18]. （原始内容存档于2014-03-21）. In the first fleeting fraction of a second, the universe expanded exponentially, stretching far beyond the view of our best telescopes. All this, of course, was just theory. Researchers from the BICEP2 collaboration today announced the first direct evidence for this cosmic inflation. Their data also represent the first images of gravitational waves, or ripples in space-time. These waves have been described as the 'first tremors of the Big Bang.' Finally, the data confirm a deep connection between quantum mechanics and general relativity. ^ Overbye, Dennis. Astronomers Hedge on Big Bang Detection Claim. New York Times. 19 June 2014 [20 June 2014]. （原始内容存档于2014-06-22）. ^ Amos, Jonathan. Cosmic inflation: Confidence lowered for Big Bang signal. BBC News. 19 June 2014 [20 June 2014]. （原始内容存档于2014-06-21）. ^ Gamow, G. The Origin of Elements and the Separation of Galaxies. Physical Review. 1948, 74 (4): 505–506. Bibcode:1948PhRv...74..505G. doi:10.1103/PhysRev.74.505.2. ^ Gamow, G. The evolution of the universe. Nature. 1948, 162 (4122): 680–682. Bibcode:1948Natur.162..680G. PMID 18893719. doi:10.1038/162680a0. ^ Alpher, R. A.; Herman, R. C. On the Relative Abundance of the Elements. Physical Review. 1948, 74 (12): 1737–1742. Bibcode:1948PhRv...74.1737A. doi:10.1103/PhysRev.74.1737. ^ Assis, A. K. T.; Neves, M. C. D. History of the 2.7 K Temperature Prior to Penzias and Wilson (PDF) (3): 79–87. 1995 [2013-11-22]. （原始内容存档 (PDF)于2011-07-09）. 也參見 Wright, E. L. Eddington's Temperature of Space. UCLA. 2006 [2008-12-11]. （原始内容存档于2011-06-28）. ^ Penzias, A. A. The origin of elements (PDF). Nobel lecture. Nobel Foundation. 2006 [2006-10-04]. （原始内容 (PDF)存档于2011-01-17）. ^ The history is given in Peebles, P. J. E. Principles of Physical Cosmology. Princeton University Press. 1993: 139–148. ISBN 0-691-01933-9. ^ The Nobel Prize in Physics 1978. Nobel Foundation. 1978 [2009-01-08]. （原始内容存档于2011-04-27）. ^ Durham, Frank; Purrington, Robert D. Frame of the universe: a history of physical cosmology. Columbia University Press. 1983: 193–209. ISBN 0-231-05393-2. ^ Brandenberger, Robert H. Formation of Structure in the Universe: 8159. 1995. Bibcode:1995astro.ph..8159B. arXiv:astro-ph/9508159. ^ 46.0 46.1 46.2 Bennett, C. L.; et al. (WMAP collaboration). First-year Wilkinson Microwave Anisotropy Probe (WMAP) observations: preliminary maps and basic results. Astrophysical Journal(Supplement Series). 2003, 148: 1. Bibcode:2003ApJS..148....1B. arXiv:astro-ph/0302207. doi:10.1086/377253. 引文使用过时参数coauthors (帮助) This paper warns, "the statistics of this internal linear combination map are complex and inappropriate for most CMB analyses." ^ Noterdaeme, P.; Petitjean, P.; Srianand, R.; Ledoux, C.; López, S. The evolution of the cosmic microwave background temperature.Measurements of TCMB at high redshift from carbon monoxide excitation. Astronomy and Astrophysics. February 2011, 526: L7. Bibcode:2011A&A...526L...7N. arXiv:1012.3164. doi:10.1051/0004-6361/201016140. ^ Wayne Hu. Baryons and Inertia. [2013-11-23]. （原始内容存档于2011-09-14）. ^ Wayne Hu. Radiation Driving Force. [2013-11-23]. （原始内容存档于2011-09-12）. ^ Hu, W.; White, M. Acoustic Signatures in the Cosmic Microwave Background. Astrophysical Journal. 1996, 471: 30–51. Bibcode:1996ApJ...471...30H. arXiv:astro-ph/9602019. doi:10.1086/177951. ^ WMAP Collaboration; Verde, L.; Peiris, H. V.; Komatsu, E.; Nolta, M. R.; Bennett, C. L.; Halpern, M.; Hinshaw, G.; Jarosik, N. First-Year Wilkinson Microwave Anisotropy Probe (WMAP) Observations: Determination of Cosmological Parameters. Astrophysical Journal Supplement Series. 2003, 148 (1): 175–194. Bibcode:2003ApJS..148..175S. arXiv:astro-ph/0302209. doi:10.1086/377226. ^ Lewis, A.; Challinor, A. Weak gravitational lensing of the CMB. Physics Reports. 2006, 429: 1–65. Bibcode:2006PhR...429....1L. arXiv:astro-ph/0601594. doi:10.1016/j.physrep.2006.03.002. ^ 54.0 54.1 Clavin, Whitney; Harrington, J.D. Planck Mission Brings Universe Into Sharp Focus. NASA. 21 March 2013 [21 March 2013]. （原始内容存档于2013-04-07）. ^ Staff. Mapping the Early Universe. New York Times. 21 March 2013 [23 March 2013]. （原始内容存档于2013-04-04）. ^ Planck collaboration. Planck 2013 results. I. Overview of products and scientific results. 2013. arXiv:1303.5062 [astro-ph.CO]. ^ Staff. Planck Reveals An Almost Perfect Universe. ESA. 21 March 2013 [21 March 2013]. （原始内容存档于2013-12-06）. ^ Overbye, Dennis. An Infant Universe, Born Before We Knew. New York Times. 21 March 2013 [21 March 2013]. （原始内容存档于2013-10-14）. ^ Boyle, Alan. Planck probe's cosmic 'baby picture' revises universe's vital statistics. NBC News. 21 March 2013 [21 March 2013]. （原始内容存档于2013-03-23）. ^ Inoue, K. T.; Silk, J. Local Voids as the Origin of Large-Angle Cosmic Microwave Background Anomalies: The Effect of a Cosmological Constant. Astrophysical Journal. 2007, 664 (2): 650–659. Bibcode:2007ApJ...664..650I. arXiv:astro-ph/0612347. doi:10.1086/517603. ^ 65.0 65.1 Schild, R. E.; Gibson, C. H. Goodness in the Axis of Evil. 2008. arXiv:0802.3229 [astro-ph]. ^ Bielewicz, P.; Gorski, K. M.; Banday, A. J. Low-order multipole maps of CMB anisotropy derived from WMAP. Monthly Notices of the Royal Astronomical Society. 2004, 355 (4): 1283. Bibcode:2004MNRAS.355.1283B. arXiv:astro-ph/0405007. doi:10.1111/j.1365-2966.2004.08405.x. ^ Liu, Hao; Li, Ti-Pei. 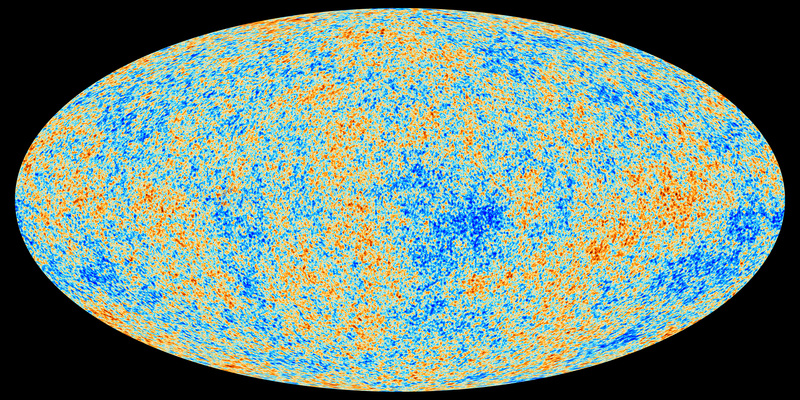 Improved CMB Map from WMAP Data. 2009. arXiv:0907.2731v3 [astro-ph]. ^ Sawangwit, Utane; Shanks, Tom. Lambda-CDM and the WMAP Power Spectrum Beam Profile Sensitivity. 2010. arXiv:1006.1270v1 [astro-ph]. ^ Slosar, A.; Seljak, U. Assessing the effects of foregrounds and sky removal in WMAP. Physical Review D. 2004, 70 (8): 083002. Bibcode:2004PhRvD..70h3002S. arXiv:astro-ph/0404567. doi:10.1103/PhysRevD.70.083002. ^ de Oliveira-Costa, A.; Tegmark, M. CMB multipole measurements in the presence of foregrounds. Physical Review D. 2006, 74 (2): 023005. Bibcode:2006PhRvD..74b3005D. arXiv:astro-ph/0603369. doi:10.1103/PhysRevD.74.023005. Copeland, Ed. CMBR: Cosmic Microwave Background Radiation. Sixty Symbols. Brady Haran for the University of Nottingham.